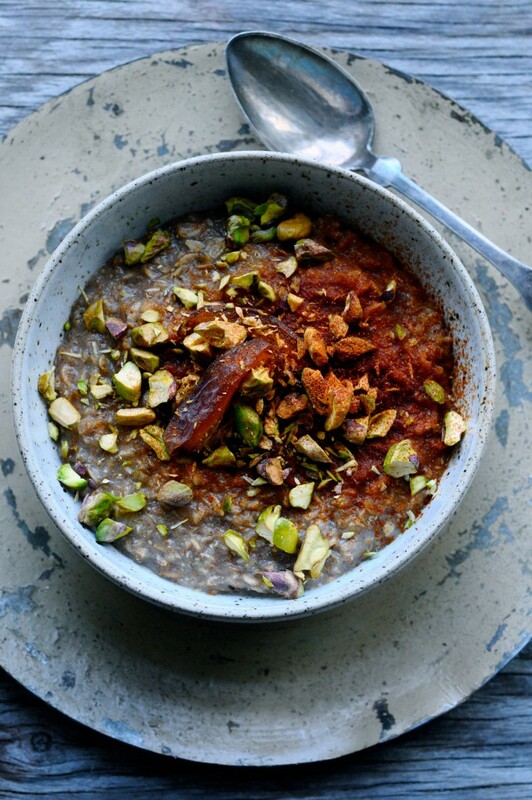 I have enjoyed this rye porridge with Christmas spices quite a few times during this holiday because it’s such a nice and satisfying way to start the day and the lovely Christmas spices gets you in the Christmas spirit right away. 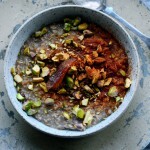 I love eating porridge in the morning and this version with rye flakes is without a doubt my favorite. The rye flakes have the most wonderful nutty flavor and it’s high in dietary fibres so this porrige can easily keep me going for many hours without feeling any hunger. Hunger havent exactly been present the last couple of days, since I’ve mostly spend my time eating the most wonderful food at my parents house. I’ve spend the holidays with my family and husband in Jutland, the mainland which is a couple of hours from Copenhagen, and we’ve had the best days with lots of great food, nich conversations and lovely walks in the snow covered forests. Simply just the most perfect Christmas! Now, I’m back in Copenhagen and the next few days until New Years Eve is going to be all about exercise and a bit more healthy food than what I’ve been enjoying the last week. No more chocolate, rice pudding or marzipan… at least for a few days! 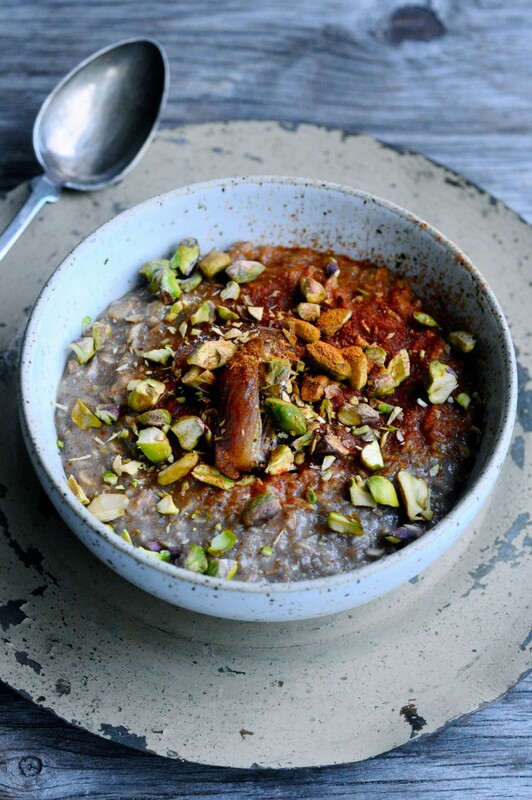 The best Rye Porridge with Christmas Spices. Perfect for cold winter mornings! Blend 2.6 oz. of rye flakes finely in a food processor for about 50 sec. Mix the finely blended rye flakes with 0.9 oz. of whole rolled rye flakes and place in a saucepan with water, milk and all the christmas spices. Cook into porridge and let it simmer for a few minutes while at the same time stirring the porridge. When the porridge has thickened and reached the right consistency, remove it from the heat. 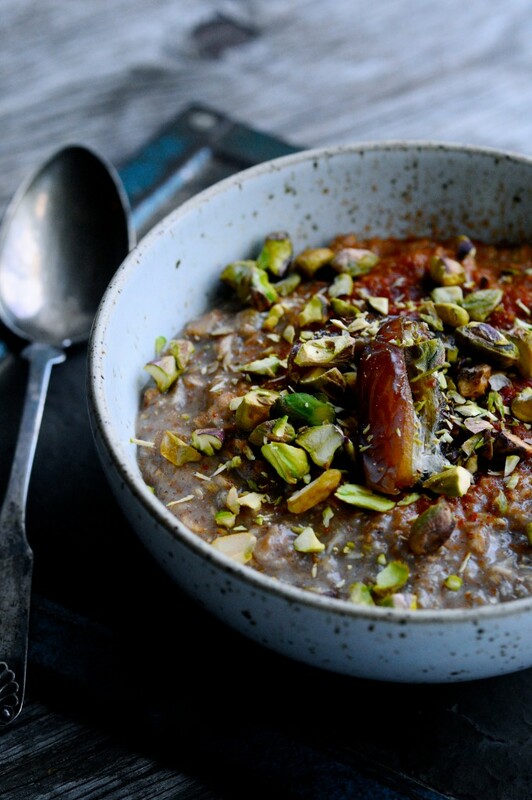 Serve rye porridge with medjool dates, pistachios and maybe some goji berry powder.